Pink (often written as P!nk) is an American singer-songwriter working in the pop-rock field. She released her first album, Can't Take Me Home, in 2000 to considerable commercial success: it went double platinum in the US, sold four million copies worldwide, and produced three hit singles (There You Go, Most Girls and You Make Me Sick). In 2001, Pink recorded a cover of the song, Lady Marmalade with Christina Aguilera , Lil' Kim and Mýa for the soundtrack of the movie, Moulin Rouge!. This single reached number one in the charts in the United States, Britain and Australia, and also won a Grammy Award. 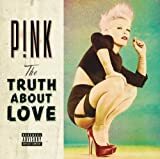 Since then, Pink has continued to release records, achieving further commercial and critical success. She also appeared in several movies, including Ski to the Max (2000), Rollerball (2002) Charlie's Angels: Full Throttle (2003) and Catacombs (2007).